You've just had the most incredible baby shower. Now it's time to give thanks to the person who made your big day go so smoothly! So what gift should you give the hostess of your baby shower? There are a lot of different baby shower hostess gifts to choose from. In this article, we will show you how to choose the perfect gift to show your appreciation. But that's not all...the top 20 most popular baby shower hostess gift ideas are also shown below. The theme at your baby shower (see the most popular baby shower themes here) was so much fun! In addition, the food was absolutely delicious, and the decorations were beautiful. The games made everyone laugh, including your mother-in law who can be a little uptight! Now it's time to show your gratitude to the hostess of your baby shower! There is so much time, energy and money that goes into planning a baby shower. The hostess spends months organizing the guest list and inviting your friends. Then she must prepare or purchase the food and choose the perfect venue. The hostess might have even created the perfect music playlist for your baby shower (see the most popular songs here). All of this is done in order to make your day super special. Sending or bringing a gift is a nice and classy way to say thank you for babyshower hosting. When is the perfect time to give them the gift? Consider bringing something with you to leave with the hostess. There is no need to make a big fuss over it though. You can just leave it on their table with a little note. You could even hand it to them when you arrive at the party. Or you can give them the gift outside of the party so that it feels more intimate (i.e. over coffee). Make sure to include a thank you note with your gift. Let them know what you liked best. Tell them how appreciative you are for all of their hard work. Be specific and use details, as it shows you really care! What type of gift should I give my hostess? When it comes to picking hostess gifts for baby showers, there are lots of great options. The type of gift depends on the type of person your hostess is. You would not give a nice book to someone who does not read often. Look at the gift subjectively, especially if there is more than one hostess. Consider the type of person they are. Think about their hobbies, favorite foods, or scents. Ask them about their favorite books and movies. Gather your information, add a little bit of creativity, and you can find or make a fantastic gift! Gift baskets are a classic and simple gift and can be fun to make. With a gift basket theme, you can add a several little items that your hostess would love. What about for the hostess that has a busy lifestyle? Get some nice smelling bath bombs, a book you know they want, or get them a bottle of wine. Any of these can help them have a relaxing evening, which they're sure to appreciate! If they would enjoy a long, cozy bath, check out this Bath Bomb Gift Set with 8 unique bath experiences. These bath bombs have natural ingredients that promote healing and relaxation, and they're super popular! If you're looking for a slightly smaller bath bomb kit, then check out this popular gift set of bath bombs by Natural Spa. You get half as many (6 bath bombs vs. 8), but they're also less expensive. They're great if you want to add them into the perfect gift basket with several goodies! Is your hostess a person who is a bit hard to shop for? A small box of nice chocolates or homemade baked goods are yummy ideas! You could also try a gift card for coffee, stationery, or candles. A nice journal, fancy pen or pretty stationery are great gift ideas for someone with a writer’s mind. For example, the Handmade Leather Journal by Moonster is a beautiful gift that will make your hostess feel like you truly get them. It's hand-made and it's absolutely gorgeous. It can be used for journaling, sketching, or even note taking. I know this is a classy and thoughtful gift I would really enjoy receiving! Giving a gift with a personal touch is always a nice gesture. Does your hostess like music? A favorite CD of theirs, with some candles, would be a perfect choice! Is the hostess a chef or do they have a passion for cooking? How about getting them a cookbook? Another great option is The Food Lab: Better Home Cooking Through Science. It was gifted to me, and I absolutely love it! Or perhaps give them ingredients for a meal with a recipe card along with some cooking supplies. Does your hostess enjoy wine? You could buy some simple wine glasses. You could get chalkboard paint and paint the bottom part of the glasses. Give them some chalk along with the glasses. They can make their own name markers on the glasses. This makes a nice gift for the hostess who likes to entertain. Is your hostess an artist? If so, a lovely drawing or sketch book with pencils is a practical and thoughtful gift. How about for the hostess with the green thumb? Homemade gifts are so nice because they come straight from the heart! I found a pretty simple recipe to make lemon mint sugar scrubs. They smell delicious and they are homemade. What is better than that? Is your hostess the grandma-to-be? You could get them a record-able book. They can record their voice reading a story. It's like they are reading to your little one every night. Mothers-to-be tend to be very busy and tired. Maybe you do not have much time, but still want to give the hostess something nice. Try one of these top twenty traditional gift ideas! Bath bombs are super popular right now! Check out this amazing set of bath bombs by Natural Spa! There's no greater gift than something that will allow your hostess to relax and rejuvenate. 2. A gift certificate to somewhere they love or Give the Gift of Amazon Prime. I've had Amazon Prime for years now (someone gifted it to me). Now I have multiple things delivered every week with free shipping of course! It's so convenient! 3. A ticket for a movie or even lunch to their favorite restuarant. Do they enjoy cooking? Then they would love to have their own mini-herb garden! Consider this Herb Garden Kit by 1-2-3 Gardens so that they can grow in their backyard or even on a porch. 5. A nice flower arrangement: It's always nice getting a flower delivery. Consider having it delivered to their home or workplace. 7. A nice piece of decor for their home: They might enjoy a wall hanging. A nice set of candle holders is a great gift, especially when they're as beautiful as these: Mercury Glass Votive Candle Holder Set by Just Artifacts. 11. A nice necklace or bracelet: it is not necessary to spend too much money on this. A nice lotion is always a great gift, especially one with their favorite scent! Nice chocolates make a great gift for your hostess! Who wouldn't appreciate such a decadent gift! If you want to be unique, you could go with fancy chocolate cookies like this amazing Chocolate Cookies Gift Basket by Barnett's Fine Biscotti! No matter what kind of gift you decide on, the message is the most important part. Make sure they know how much you appreciate your baby shower. They put a lot of effort into making sure your day was perfect. So get the perfect gift for them! 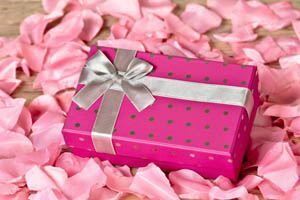 It is not necessary to get an expensive gift for your hostess. If you're on a tight budget, something in the $10 to $40 range is totally fine. Remember to keep your gift simple and thoughtful!